A curling iron helps you transform your hairstyle. Adding curls to your locks with a curling iron transforms straight hair into a voluminous, sassy hairstyle. There are many different types of curls, from tight to loose and wavy. Control the shape of your curls by using different sizes of curling irons. Manipulate the direction of the curl by the way you hold your curling iron. A good curling iron along with good technique produces perfect curls. Divide your hair into three sections -- back, right side and left side of your head. Curl the back section first. Use hair clips to pin up the other two sections. Plug in the curling iron. Choose the correct heat setting. If you have thick, unruly hair, it's best to choose a high heat setting. A lower heat setting is good for fine, easily damaged hair. Let the curling iron fully heat before beginning. Grasp a 1 to 2-inch section of hair from the back and clamp the curling iron in the middle of it. Slide the curling iron down to the end of the section. Roll the curling iron so that the hair wraps around it until it's about 3 inches away from your scalp. Hold the curling iron still for about 20 seconds. Unwind the hair from the curling iron and allow it to fall down. Curl 1 to 2-inch sections to complete the entire back of your head. Once you have finished with that section, spray it with a lightweight hairspray if your hair easily loses curl. Take out the clip from your left or right section and repeat the curling process you used on the back of your head. Use the same method on your last section of hair. Check your curls in a mirror. If you think they need more volume, use a lightweight mousse. Spray the mousse on your hands and gently scrunch it through the curls. To achieve wavier, looser curls, run a wide-tooth comb through your curls in small, short strokes. A large-barrel curling iron produces big, bouncy curls, while a small-barrel curling iron creates tight curls. 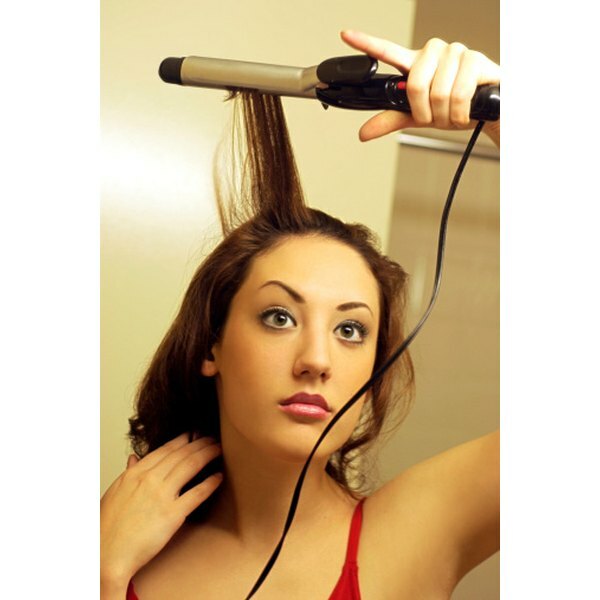 Use of hot styling tools can damage hair over time. Limit your use of such tools to a few times a week or less. Depending on the brand and type, hairspray and mousse may make your curls stiff and crunchy. Look on the product can or bottle for words like "touchable" or "flexible," if you want soft, brushable curls.